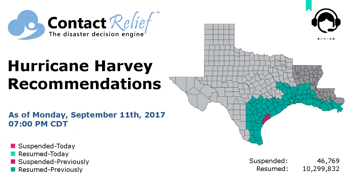 ContactRelief recommends resuming contact with all Houston and Beaumont consumers. 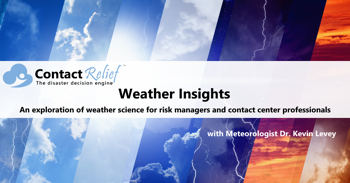 ContactRelief Meteorologist Dr. Kevin Levey examines Hurricane Harvey in this 2nd installment of a 2 part series that every risk manager and contact center professional should read. 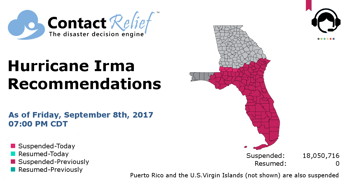 ContactRelief recommends additional contact suspensions for Alabama, Georgia, and South Carolina. ContactRelief recommends continuing contact suspensions for all or Florida, and parts of Alabama, Georgia, and South Carolina. 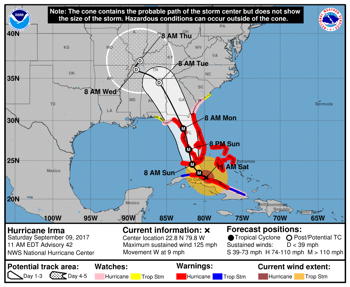 Category 4 Hurricane Irma's landfall in the Florida Keys is imminent. ContactRelief recommends suspending contact with consumers in certain Alabama and South Carolina counties and additional counties in Florida and Georgia. ContactRelief recommends resuming contact with consumers in certain Texas zip codes. 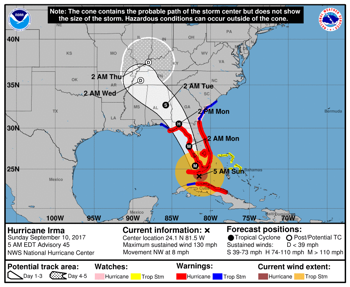 Cat 3 Hurricane Irma is making its presence known as tropical storm force winds reach the tip of Florida. 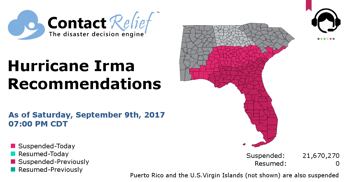 ContactRelief recommends suspending contact with consumers in additional Georgia counties as Hurricane Irma's path solidifies. Want to reach up to 5 times more contacts during a disaster?